Join Rohit Krishnan writer and techie as he explores sweet life in Kozhikode town. Little Basheer loved to hear stories. Every night, as his dad put him to bed, he used to tell him a wonderful fable.It was a tale about a magical place, full of candy shops –their shelves overflowing with colourful goodies. The story was always the same, but Basheer never got tired of it. It was every child’s fantasy. Nearly 40 years have passed. Little remains of that magic, which Basheer’s dad once spoke of. Gone are those old candy shops which gave Mitai Theruvu (Sweet Meat Street) its name. There is just Basheer; and his cart full of sweets. The unrelenting afternoon sun beat down upon our petty heads without an iota of remorse. Three trips up and down the length of Mitai Theruvu had reduced us- three strapping young lads- into a dripping panting mess. No sign of any candy makers. This was just another marketplace. The years have not been kind to him.His face is lined,his beard is patchy and what is left of his hair is starting to grey. It struck me as quite odd that a street which was characterized by a very noticeable absence of sweet shops should be called ‘Sweet Meat’ street. I walked up to him and enquired the reason behind the strange moniker. Overhearing our exchange a roadside vendor, Abd ulla, joined in the conversation. “Back then this area was populated by mostly Seths and Parsis who came from outside Kerala.” When they settled here a little part of their culture was assimilated into our own. “Even the famed ‘Halwa’ was brought to Kozhikode by these foreign settlers,”says Abdulla. 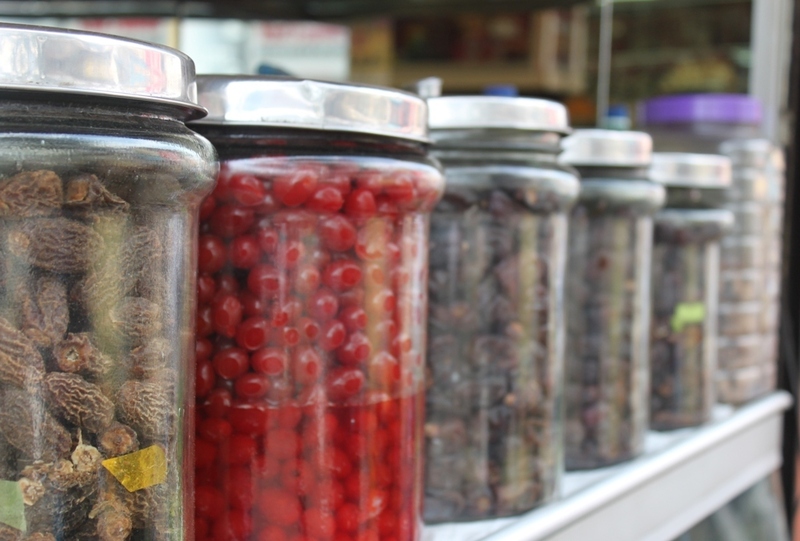 There was a time when there were sweet shops littered all over Mitai Theruvu. As you strolled down the busy street, you would be greeted by the mouthwatering aroma of boiling ghee, ground spices and caramelising sugar. As Abdulla took a trip down his memory lane, we could smell that delicious aroma inside our heads. His words had only helped to whet our appetite. We decided to press on. With a wide grin revealing yellow stained teeth, Basheer bid farewell. Desperately wanting a good luck charm we welcomed it. Abdulla directed us to visit one of the bakeries at the far corner of Mitai Theruvu, to find out more about the traditional art of candy making. At the very end of the street we finally spotted three bakeries huddled close together. One of them is the ‘New Oriental’ bakery. According to the board, this bakery has been around right from the twenties. Excited, I entered. 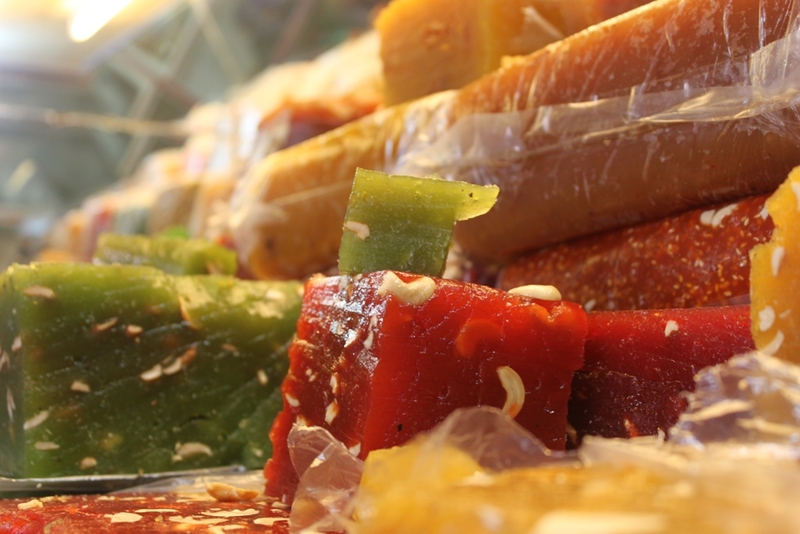 Like any other bakery in Kozhikode the first thing you notice is the large glass cupboard ,with its back mirrored, and piled to the top with massive blocks of Halwa. The sheer number of shades, scents and flavours can overwhelm you. For a first timer, it is a lot to take in. Normally I’m not a huge fan of the Halwa. 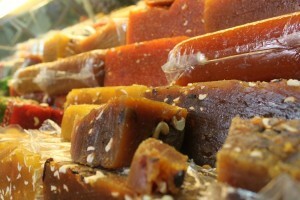 Even though I do enjoy the occasional piece, I -more often than not – respectfully decline, when somebody offers me one.The last time i had a halwa, it stuck to the roof of my mouth and i spent several agonising moments unable to explain to the people around me why I had suddenly fallen silent. When I did finally manage to down the sucker, it stuck to my throat and nearly choked me.Since then i have always regarded the sweet with a degree of distrust. It is not that I dislike the delicacy. We just weren’t meant to be. However, today, occasion demanded that I have a taste. Reluctantly i popped a piece of halwa into my mouth.My jaws went immediately to work gnawing, chomping and munching on the sweet, gummy mass . “Hey, this isn’t too bad”, I thought. True.It wasn’t like any of the halwas i had tasted before. Just the right amount of sweet and just the right amount of sticky, there was something delightfully engaging about the halwa. It felt nice and chewy, rolling around inside my mouth. All that chomping was providing a nice outlet to the pent up frustration of the previous days. After a few rounds of serious chewing, my tongue would deftly roll the piece over to the other side of my mouth for another bout. Left to Right; Right to left; my mouth alternated with impeccable rhythm. When I did somehow manage to swallow a piece, the shop boys would graciously offer me another slice, this time from a different flavor. Fate was extracting revenge on me for all the Halwas I had declined over the years. This cycle went on for a good fifteen minutes before my jaws were nice and sore and I could chew no more. Shahul and Sandeep the boys in charge of the shop shared with me the secret to a good Kozhikodan Halwa.The secret is that, there is no secret.The people of Calicut have been making Halwa for so long that they have become incredibly good at it. 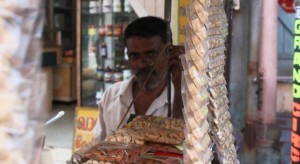 “When you have had a taste of our Halwa, you notice that the other Halwas, dont quite cut it anymore,” says Sandeep. “We make halwa from the most refined form of maida(highly filtered wheat flower),unlike the others who use rice flour as a substitute.Halwa made from Maida is without doubt more delicious,” replied Sandeep. 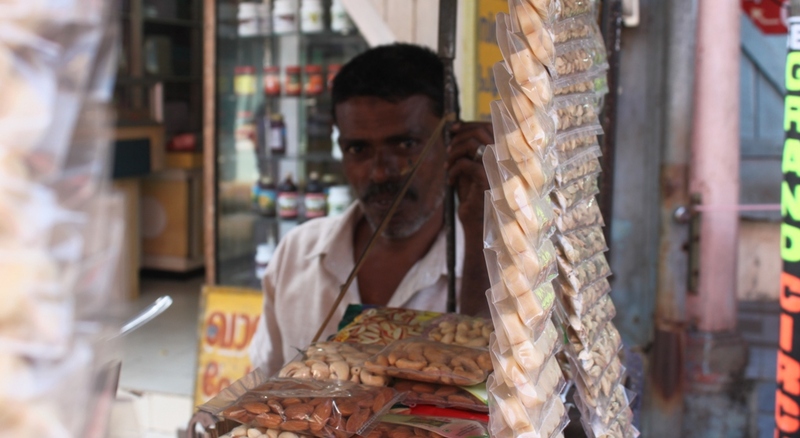 The bakery sells 50 kilos of halwa on average each day.The demand is greater during festive occasions says Shahul. Every two weeks they receive a fresh batch. Thanks to its long shelf life every batch is sold out long before it goes stale. “There has never been an occasion where we have had to throw away even a kilo”,says Shahul. The plant at East Kallai supplies halwa to ‘New Oriental Bakery’ and the other half a dozen bakeries that are part of the same chain.To supply so many bakeries the plant has to make more than a hundred kilos each day.I imagined a huge factory with automated machinery churning huge slabs of halwa , as workers clad in pristine white overalls packed them into large crates, ready to be sent off to the bakeries for sale.Wanting to see all the action, I requested him to take me to the plant. He told me to return early next morning. I thanked him profusely and promised to arrive by 8’o clock the next day. Sandeep was waiting for me outsi de the bakery when i reached.I glanced at my watch. 5 minutes to 8 . Good. I wanted catch them before they started the days work. The plant is just an 10 minute auto drive away. The driver dropped me off near a dingy run-down neighboourhood ,right next to an old bridge.I wondered where they could have hidden such a huge factory in a place like that. At the end of the street was a small alley that lead to a rickety old shed. From inside thick plumes of smoke billowed out. Surely this could not be the place where they made quintals of halwa every day. Inside the shed, two people were hunched over a huge cauldron, mounted on top makeshift stove. One of them was pouring some kind of solution into the vessel while the other stirred hard with a wooden ladle.A third fellow stood at the corner of the room, moulding a viscous mass into rectangular blocks.All three of them wore identical green lungies. The whole scene took a few moments to sink in.This was not what i had in mind. In the adjacent room enormous rectangular slabs wrapped in translucent butter paper were stacked neatly one above the other.Through the oil stained wrapping i could make out different shades of orange, red, and yellow. Five minutes in that small stuffy shed, had me gushing sweat from every pore in my body. The heat and fumes stung my eyes. I could barely keep them open. Jassie, Shihabudeen and Majeed were so immersed in their work that they hadn’t noticed me enter. I could barely see their faces,over the smoke and dust. It was a few minutes before they spotted me.The three of them were all smiles when I told them I wanted to see how the sweet was made. They explained to me that the liquid in the cauldron was a solution of maida and sugar in water.According to the kind of halwa that is being made ghee or oil is also added.”Ghee halwa is costlier”, says Majeed. “A little salt is also sprinkled to give a nice balance to the flavour,” adds Shihab. The mixture is heated over a stove,with continuous stirring. “To make sure that no lumps are formed,” explained Majeed. Soon a thick semi solid material starts appearing on the surface of the liquid. Its the halwa, separating out from the rest of the mixture.The gooey mass is then carefully skimmed off the surface and shaped into rectangular slabs. Halwa making is an art.You can experiment with the flavours and fiddle around with the proportion of the ingredients to create new tastes.It takes a lot of creativity and imagination on the part of the candymaker to discover a new flavour.There are the usual fruit flavours like mango, banana , grape, dates and the not so conventional flavours like carrot, chocolate and guava. There are also some truly exotic flavours like Boost, Horlicks and Copra. No artificial flavouring agents are added. All the flavouring ingridients used are 100 per cent natural, they assure. Some of the flavours are based on recipies that have been passed down for generations. 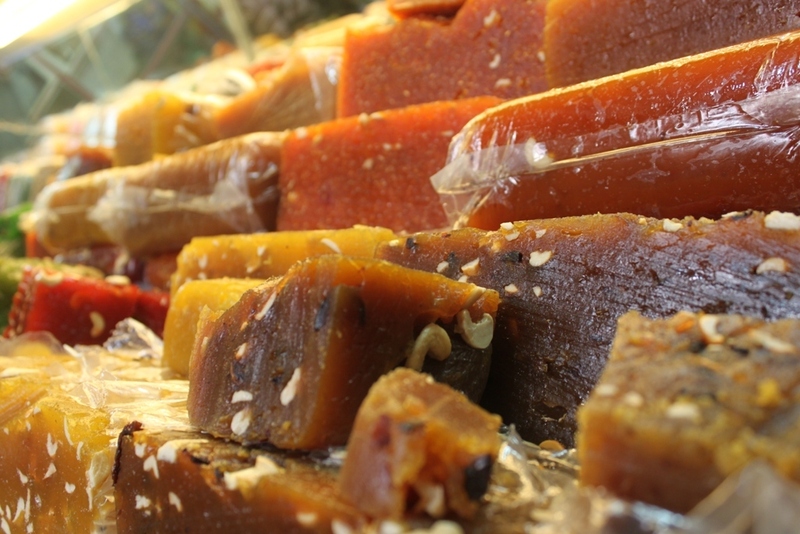 The recipies for Copra and Jaggery halwa have been around for more than half a century. The candymakers work from dawn till midday,five days a week except during the monsoon season.Day in and day out, they brave the intense heat and fumes of the kiln to earn just enough to sustain their families. But never do their faces droop; never do their smiles falter.Blessed folk they are for having brought a touch of sweetness to so many lives.For the candymakers of Calicut the hearth is always burning. Rohit Krishnan has written 2 stories in Rum, Road & Ravings. You can read all posts by Rohit Krishnan here. ← Freekick Classic: Who’s Afraid of the Kerala Police?